Joshua Elkington and Vikram Dhillon provide two different reviews of technologies. One on the available equipment for personal biotechnology and the other on the use of the CRISPR-Cas system for genome editing. After you’ve sent samples to uBiome for sequence analysis, what do you do with that microbiome data? Richard Sprague writes about tools for analyzing your raw microbiome sequence information to help you learn more about the diversity in your personal ecosystem. What are you doing to make biology or biotechnology more accessible? Are you developing low-cost laboratory hardware, open-source software tools for data analysis or bioinformatics, tools in biology education, laboratory automation, easy-to-use or high-throughput diagnostics, accessible biology reagents, or anything related? We want to hear from the at-home biologists or those working in community labs, researchers in academic labs, and the biotech startup community. 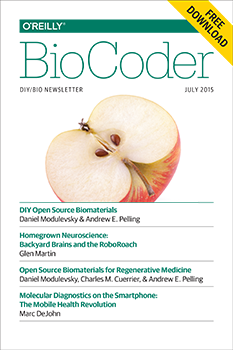 Email us at biocoder@oreilly.com.